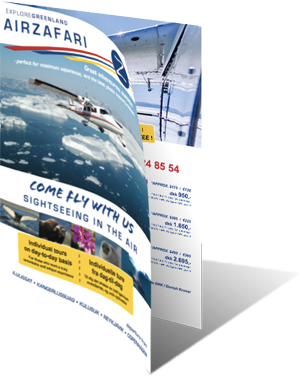 AirZafari is a company dedicated to delivering unforgettable experiences from the air. The company was started in 2010, by Bente Biilmann Larsen and Jens Ploug Larsen, wife and husband. Bente and Jens both have many years of experience in the aviation industry, both operating as pilots today. While sharing a fascination of the diverse Greenlandic landscape, they felt the need of filling the gap affected by the lack of opportunities for travelers and tourists to witness the wonders of Greenland with their own eyes. This is how AirZafari came to be. The story behind the name "AirZafari" is by no means a coincidence. "Zafari", intended as an alternate spelling of Safari, refers to the tundra environment close by the city of Kangerlussuaq. Safari, being typically associated with the continent of Africa, has a close resemblance to the amazing scenery, you will find near Kangerlussuaq, especially the area, and in some parts a protected nature reserve, known as Paradise Valley. We operate two Vulcanair Partenavia P68 airplanes. These airplanes are ideal for the purpose of sightseeing flights. Being high wing mounted with large windows at each seat, you have the perfect conditions for taking pictures and bringing your memories back home, as well as giving you a clear view of the landscape. The Partenavia, can carry up to 5 passengers plus the pilot, with one of the seats right next to the pilot in the cockpit, where you can follow all the procedures and technical aspects of the different phases of flight, for those who are fascinated with the task of handling the airplane. We also recommend this seat when flying with professional photographers, since the front row seat features a hinged hatch, that can be opened to provide a completely unobstructed view of the overflow areas, eliminating potential glare from the windows. We require the hatch to be closed on our regular scheduled sightseeing flights, but you are welcome to contact us, if you want to make use of this feature during your flight. For safety reasons, we have certain requirement to the kind and operation of the equipment used. Headsets are provided for all guests to minimize noise and ensure clear communication between passengers and the pilot.